We have conductive thread. Conductive thread is usually used in costuming when one wants to integrate electronics like blinking LEDs into one’s fancy dress. Conductive thread is also great for modding gloves to be smart phone friendly - a couple of stitches and you can click and type to your heart’s delight without taking your gloves off. 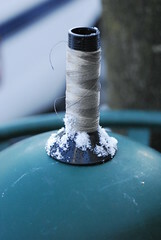 Conductive thread is handy stuff to have when it’s cold out, and right now, we have it. What we do not have are snowmen. We are greatly desirous of some little snowmens - with all the traffic on N Broadway, there isn’t a lot of good snow left to make them with. And even if there was, we are very busy in our workshop, what with all the lasering and crafting and making that we have to do in preparation for the holiday season. In the festive spirit of snOMG 2010, Metrix is conducting a small contest. A challenge, if you will. We have conductive thread, and you may have a little snowman. The first five people to bring us a snowperson* with which to decorate our sidewalk will get their gloves modded with conductive thread for free. You will get conductive thread and we will even sew it into the fingers of your gloves for you, in exchange for a snowbuddy made from actual snow. *This term is inclusive of snowwomen, snow-intersexed, and snow-genderqueer individuals, as well as snowmen. Only snowpeople made from actual snow will be accepted for this challenge. Hurry up and bring us some before the snow melts!